Detroit’s Pewabic Pottery is one of only two active turn-of -the-century pottery studios in the country. Its work, known for deep, richly-colored glazes, can be found in classic structures in Detroit and across the nation. Tom Phardel’s design recalls the art deco style, using glazes reminiscent of Mary Chase Stratton’s Pewabic work during the hey-day of America’s Arts and Crafts Movement. 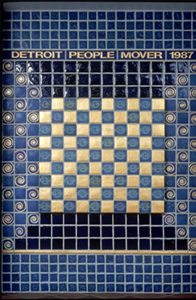 As a tribute to “Art in the Stations”, the independent non-profit agency who commissioned and installed the art works in the Detroit People Mover Stations, Pewabic Pottery has designed a signature mural. 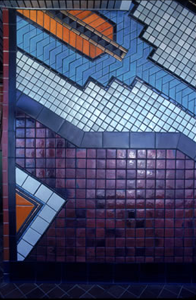 Incorporated in this colorful mural are the commemorative Pewabic tiles, with the “Art in the Stations” logo, that were given to guests at the opening ceremony for the station art works in 1987.